The healthcare industry has evolved a lot in the last few years. Today, patients are at the center of their healthcare experience. If experts are to be believed, analytics in healthcare play a significant role in patient engagement and retention. Some of the key highlights of using healthcare analytics are building a pro-active, sustainable healthcare system and usher in accountability and transparency, promoting data-centricity and data literacy; and delivering supply forecasting, dynamic budgeting and reducing overall cost. However, as the amount of patient data is expected to reach 25,000 petabytes by 2020 according to a report by IDC Health Insights, and continues to grow in volume with higher velocity, healthcare companies need accurate analytics that can organize this data into insights. But before reaching the stage where healthcare companies can easily implement a comprehensive analytics solution, they need to clean, accurate and format existing data so that it can be used in multiple systems. Also to streamline adoption of healthcare analytics and maximize value, healthcare providers should look for an experienced healthcare analytics solution provider, who can deliver quick time-to-value, flexibility, and expertise. The other key challenges in implementing healthcare analytics are lack of storage and security. So it is really important for healthcare companies to select the right healthcare analytics solution provider who understands their requirements. In the last few months, a distinguished panel comprising of CEOs, CIOs, VCs, analysts including Healthcare Tech Outlook’s editorial board has reviewed the top companies in the healthcare analytics space and shortlisted the ones that are at the forefront of tackling industry challenges. The selection panel looked at the vendors’ capabilities to fulfill the needs of buyers with effective solutions that curb the challenges associated with healthcare analytics. In this edition of Healthcare Tech Outlook magazine, we present to you “Top 10 Healthcare Analytics Solution Providers - 2018,” featuring the companies that are creating an impact in the healthcare sector. BERG is a leading healthcare analytics solution provider that aims to speed up the clinical identification and recreating therapeutic targets to treat disease. The company provides effective precision treatments for patients with discovery and development and lowering the costs for the healthcare system. Harnessing the power of AI combined with patient biology, BERG revolutionizes treatment across neurology, oncology, and rare diseases. BERG’s interrogative biology which is based on hypothesis-free, data-driven philosophy applied to biomedical research is a disruptive platform for biopharma. The platform uses a wide range of high-throughput molecular profiling technologies and human biological samples and performs deep molecular phenotyping in lipidomics, proteomics, and metabolomics. It is applied in drug repositioning, target discovery, biomarker discovery, and mechanism of action discovery. Champs Oncology is a premier healthcare analytics solution provider that is transforming high-quality cancer data into actionable information for cancer programs and healthcare providers and improving patient care across the world. For more than 40 years, the company has been providing personalized strategies and solutions for cancer program consulting, supplemental outsourcing, and complete outsourcing with its team of experienced certified tumor registrars and highly skilled cancer information specialists. The specialization of the company is in developing and delivering comprehensive registry solutions, implementing registry quality standards, achieving abstracting accuracy, and advising clients on the Commission on Cancer (CoC) accreditation process. Champs Oncology also captures data for QOPI certification and NAPBC accreditation and provides cancer data analytics employing insight2oncology. The cancer program consultants of Champs Oncology assist the hospitals with the interpretation and implementation of the CoC guidelines and standards by providing recommendations and guidance. DarkMatter2bd leverages modern technologies to help optimize clinical and marketing programs while reducing costs and accelerating results. The healthcare analytics solution provider collaborates with clients to deal with complex clinical and business challenges. Modern data visualization unseals the capability of integrated disparate data by making complex data easy to interrogate. The focus of the company is to increase revenue and reduce the costs and exceed the strategic objectives of the businesses by leveraging the modern technology and power of healthcare data. MedFuse clinical by DarkMatter2bd, offers insights into patients’ population and accelerates patient recruiting by providing comorbid disease filters to identify the right patients and identify top physicians quickly by diagnosis and procedure. The data of MedFuse is deployed on Qlik which is a leading provider of modern data visualization tools. MedFuse is a business user-friendly system and does not require any IT personnel for its operation. 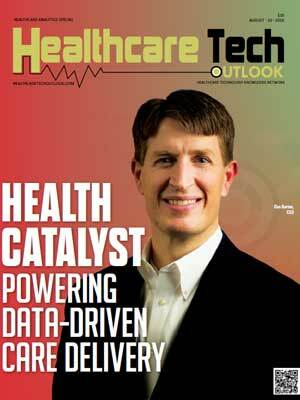 Health Catalyst provides a comprehensive and fully integrated suite of healthcare data warehousing, analytics, and process improvement solutions to enhance care delivery. The company is a prominent healthcare analytics solution provider that aids healthcare companies to improve care by availing the solutions for process improvement and building the most comprehensive and fully integrated suite of healthcare data warehousing. Healthcare veterans with the experience of data warehousing and data improvement had formed Health Catalysts to transform clinical models utilizing analytics. The company discovered a solution called adaptive data architecture to handle the complexities of healthcare in a quest to develop a data warehouse. Because of the flexibility of Catalyst’s adaptive data model, it can be implemented in a few weeks as compared to the traditional approaches which needed months or years. Analytics adoption model enables healthcare companies to understand and leverage the potential of analytics and achieve the objective of enhancing the quality of care, clinician and patient satisfaction, and lowering the costs. Kairoi Health is a medical technology company that is commercializing a breakthrough innovation for analyzing and optimizing scheduling in healthcare organizations. It is a healthcare analytics solution provider that offers a software as a service (SaaS) KairoiSuite which is cloud-based schedule-optimizing software that does not require on-site IT support and integrates analytics of actual clinic performance logistics engine. A robust clinical appointment analytics system, KairoiLogic identifies causes of lost productivity by equipping clinic managers to analyze historical appointment data. The user-friendly workflow optimization application, KairoiScheduler makes templates scheduling easier that are based on organizational goals, historical data, and preferences of the providers. These three features in collaboration help organizations to achieve performance goals, optimize provider productivity, enhance staff satisfaction, and raise revenue. Stryker is a performance solutions partner with physician practices and groups, hospitals, and payers to provide clinical and analytics to help optimize care delivery performance. Innovative products and services offered by the company in medical and surgical, orthopaedics, spine, and neurotechnology help in improving the hospital and patient outcomes. Stryke also offers learning and training programs such as LEARN to support, empower and advance medical teams; Focus RN created by nurses for the nurses to educate them about day-to-day challenges faced in patient care; and TEACH for trauma extremities course. The onsite services of the company offer personalized workflow solutions to reduce challenges of sterile processing department and operating room so that patient care can be improved. The company follows the FDA regulatory requirements in reprocessing of medical devices and ensures to meet the standards of original equipment devices. Viewics is one of the foremost healthcare analytics solution providers that deliver a range of solutions which enable healthcare organizations to realize their measurable operational value. The company provides an end-to-end laboratory platform that allows healthcare companies to improve operational effectiveness, financial performance and patient care across the healthcare continuum by surfacing actionable insights. The vendor-agnostic solution of the company extracts data from almost every system and does not cause any downtime. Viewics labops measures daily laboratory performance according to the key operational metrics and keep stakeholders informed with alerts notifications, and automated report about laboratory process and turnaround times. Viewics labops is easy to install with minimal involvement of IT personnel. The instinctive platform of the company is designed keeping HIPPA principle and security in mind for securing firewall initiating from the Viewics network and controlled user access across all levels. It eliminates the problem faced earlier such as lack of streamlined analytics that prevented laboratories from supporting larger health system initiatives, delay of information due to retrospective approached for laboratory structure, and action plan to uncovered issues. Apixio offers a computing platform that extracts and analyzes clinical data in electronic and PDF health records, generating deep insights into patient health. The platform of the company generates insights from the text and coded data utilizing artificial intelligence for better decision making. This trusted healthcare analytics solution company is known for its healthcare data analysis engine. The technology of the company efficiently reads and applies learnings from unstructured data and changes it into actionable information. It aids providers and payers to enhance their care and compliance programs using better data acquisition, effective coding, and insights. Healthcare data is hard to access and analyze unless the right tool is being used. Apixio’s AI platform uses simple and secure extraction process to pull and encrypt the data such as images, documents, and billing claims from company’s customer source system which is then transmitted to data loader for import into a cloud-based platform for processing and analysis. Flatiron is offers a platform which pairs clinical oncology experts with innovative technology to rapidly generate high-quality data directly from the EHR. The aim of the healthcare analytics solution provider is to bring together various communities to fight against cancer by learning from the experience of every patient. The products of Flatiron connect community oncologists, hospitals, academics, regulators, and life science researchers on the shared technology platform. Flatiron’s OncoCloud offers a reliable and comprehensive suite of software and services in community oncology. Community clinics use this technology to provide better patient care, while at the same time, remaining independent, efficient, and financially affluent. To thrive in the world of value-based care, the OncoCloud suite has been designed to meet the technical requirement of the community practice. More than 2,500 clinicians across the world have embraced Flatiron as their long-term technology partner. Roam Analytics is a leading healthcare analytics solution provider which uses data and machine learning to empower biopharmaceutical and medical device companies to make informed decisions, provide effective treatments, and achieve the best patient outcomes. A data-driven approach is required to solve the most complex problems of healthcare. Roam allows healthcare companies to improve healthcare facilities by deriving structured meaning from language data. The technology of the company is being used by healthcare organizations including biopharma, payers, and hospitals to make use of their language data. The platform of the company is designed to help companies make better-informed decisions for their businesses by quantifying language data. The platform unveils the value of data across a variety of sources and allows companies to arrange and structure that information to drive high-value business.